A Learning Design Model for Africa? Digital education products and platforms are often brought into Africa from more advanced digital societies such as the United Kingdom or the United States of America. While these products could be world-class and highly effective in the markets they were developed, they have not been conceptualised with the societal, cultural or technological contexts of Africa schools and learners. Dabbagh and Bannan-Ritland’s Integrative Learning Design Model, posited in their book Online learning: Concepts, strategies and application (2005) is a pedagogical approach that aims, through a series of phases, to decide on the most appropriate learning technologies and learning strategies required to achieve a specific learning objective. 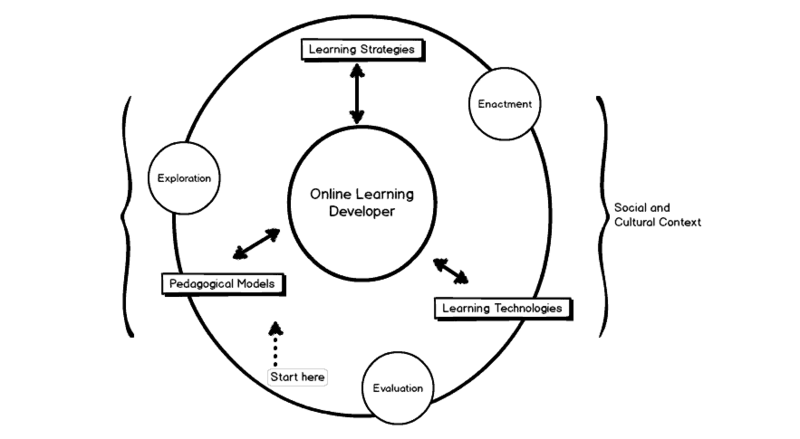 The three phases of exploration, enactment and evaluation form a circular model, with the learning developer situated at the centre. Each of these phases have a number of tasks or actions that need to be completed. I have illustrated them as circles within the larger circular framework in the diagram below. The initial exploration phase begins with a decision around the specific learning objectives required; research into the the social and cultural context; a profiling of the students and educators; and exploring appropriate learning theories to use in order to achieve the learning objectives. The enactment phase targets specific pedagogical strategies and then analyses the affordances required by the learning object and offered by various technologies, in order to find a suitable match. A prototype could be developed at this stage. The evaluation process forms a structured feedback from colleagues involved in the development or implementation of the learning object as well as a potential user or student. This evaluation can be used to refine the product, correct any errors, or bring to the fore any underlying assumptions the learning designer may have. Dabbagh and Bannan-Ritland’s Integrative Learning Design Model. Adapted diagram by Niall McNulty. and a prototype could be developed at this stage. The evaluation process forms a structured feedback from colleagues involved in the development or implementation of the learning object as well as a potential user or student. This evaluation can be used to refine the product, correct any errors, or bring to the fore any underlying assumptions the learning designer may have. Peer – questionnaire to be answered by the developer for this project, focused around the conceptualisation of the prototype and how this might flow into the project implementation as well as the technology choices and any potential issues. Assumptions are often made, by international organisations as well as local technology or media companies, on what approach would work best for South African students without taking cognisance of the unique challenges facing South African students. These challenges can, conversely, often force innovative approaches and decidedly African solutions to everyday problems, with the mobile money service M-Pesa being a well-documented example of this. Without this awareness of the particular local challenges and sensitivity to local cultural contexts, no educational intervention would be successful. The phased approach, which structures the development of the learning activity, allows for the most appropriate strategies and technologies to be adopted. The circular nature of the model allows for iterations to be made, both at an individual phase and a larger project level, which can be fed back into the project to improve it. Lastly, putting the learning developer – as opposed to the product or technology – at the centre means that the project will have a strong pedagogical approach and a clear roadmap in regards as to why things have been done the way they have. Dabbagh, N & Bannan-Ritland, B (2005) Online learning: Concepts, strategies and application. Upper Saddle River, New Jersey: Pearson. This entry was posted in Education and tagged Technology on March 10, 2016 by Niall McNulty.